The Juice Press, which has 18 locations, is one of many vegan restaurants highlighted in our 2014 Vegan Restaurant Guide to New York City. 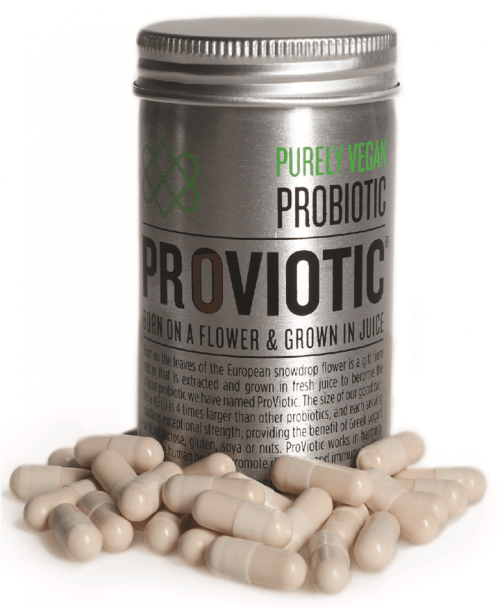 But it’s the only one we know of that is offering a breakthrough vegan probiotic product line called ProViotic. The probiotic comes in capsule form and also in two juices. The products are derived from bacterial strains that are said to be pristine. The bacteria is found in the European snowdrop flower grown in the mountains of Bulgaria and cultivated in fresh green juice. Michael Karsch, founder of hedge fund Karsch Capital Management and the lead investor in Juice Press, told the NY Post that he learned about it from a Bulgarian business associate. Juice Press founder Marcus Antebi believes that ProViotic is “the most important thing to happen to the raw juice movement since the invention of the juice machine.” On the Juice Press website he points out that most probiotics on the market, in addition to good bacteria contain one of the major allergens: lactose, gluten or soy. ProViotic does not contain any major allergens as it is grown in pure vegetable juice sourced from GMO free farms. Most probiotic bacteria are isolated from the human mouth or gut, which requires their manufacturing process to involve animal-based proteins. Because ProViotic is sourced from the European snowdrop flower, it does not require any animal-based proteins and thus ProViotic is 100 percent vegan. ProViotic’s good bacteria is four to six times bigger than other probiotic bacteria. Its ability to outcompete bad bacteria such as E. coli and Salmonella has been proven in some of the most prestigious academic institutions in the United States. 1) 60 percent of the human immune system resides in gut. Probiotics are good bacteria that stimulate the human immune system in its fight against bad bacteria. 2) The human body carries about 100 trillion microorganisms in the intestines, a number 10 times greater than the total number of human cells in the body. Part of this gut flora is bad bacteria that can cause infection in the digestive system. Helpful bacteria prevent the growth of bad bacteria by competing for nutrition and attachment sites to the colon. 3) Antibiotics are important way to treat bacterial infections; however, antibiotics also kill both good and bad bacteria indiscriminately affecting the overall balance of the gut flora. Probiotic bacteria can help restore the balance of the gut flora. 4) 20 percent to 50 percent of international travelers develop traveler’s diarrhea annually. 80% of these cases are caused by bad bacteria. Taking probiotic can support the immune and digestive system during your travel. For more information visit www.juicepress.com.